Just like everything else in our modern workplace, the way we attract and retain top talent is changing. Instead of being recruited straight out of college and being put on a path up the corporate ladder, employees now have much more flexibility and choice in their careers, which means organizations have to adapt their approach to finding and keeping great workers. At the top of the talent game is Deloitte, the world’s largest professional services organization, and its Chief Talent Officer, Mike Preston. Deloitte has evolved its talent practices to stay ahead of the trends, and Mike offers a number of ways the talent market is changing and what organizations can do to stay ahead of the curve. Call it the gig or freelancer economy or any other number of terms–according to Mike, this is the biggest change in talent management and will continue to be so over the coming years. Some people estimate that by 2020, 40% of workers will participate in this way of working in some form or another, either as a full-time position or a side hustle. Organizations can’t ignore the open talent economy–doing so could mean missing out on 40% of the workforce, which is a huge group of talented people. The most successful organizations are embracing the change and making sure the contractors they hire meet the needs and the rigor of their organizations. Not every employee wants to follow this path, however, so navigating through the future talent market means balancing traditional workers with those who want a more flexible path. We hear a lot about the younger generation of workers that is coming to the workforce is strong numbers, but don’t underestimate the power of Millennials. This generation is used to disruption and has spent their entire lives with technology, so their expectations of the workforce may be different. 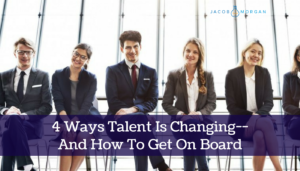 They are often willing to do things outside the normal talent structure and take an individualized approach to their careers, so organizations that can stay on top of those demands will have a better chance of attracting new thinkers and leveraging their unique skillsets. Millennials may get a bad rap about their selfishness and inability to work hard, but much of that is changing, especially as we see older Millennials start to move into managerial positions. Characteristics that could be viewed as “negative” can also be seen positively when approached correctly, such as the need for work/life integration, flexibility, and love of technology. In many cases, Millennials are also driving forces behind inclusion and cultural initiatives, which can create a richer employee experience. Today’s talent pool has a huge desire to expand their learning and experience new things. Especially in the ever-changing tech landscape, it’s important to continue learning and acquiring skills, and modern employees know that. Organizations that only give employees a single type of experience risk losing talent to more well-rounded companies. Development plays a major role in companies that are known for good talent management practices. Deloitte built a Deloitte University campus where employees from throughout the company can come to collaborate, teach, and learn, and which has become the heart of a company culture that is centered on constantly developing employees. In order to retain great employees, give them chances to learn and grow within the organization and on their own, and provide them with incentives and motivation to move up and around within the organization. A list about how the workplace is changing wouldn’t be complete without technology. In this case, technology is about more than just the physical tools employees use–though having good equipment is important–but it also considers how companies are using all that data created by technology. Tech-savvy companies that know how to use data are a huge draw to employees because it shows the organization is prepared for the future while also understanding the flexibility that new technology offers for things like working remotely and collaborating around the world. Talent management is an evolving ecosystem that has many different factors. In order to truly be successful at attracting and retaining top talent, organizations need to be in tune with the overall landscape of the space and what their employees are looking for. Learn more about the future of talent here. My new book, The Employee Experience Advantage (Wiley) analyzes over 250 global organizations to understand how to create a place where people genuinely want to show up to work. 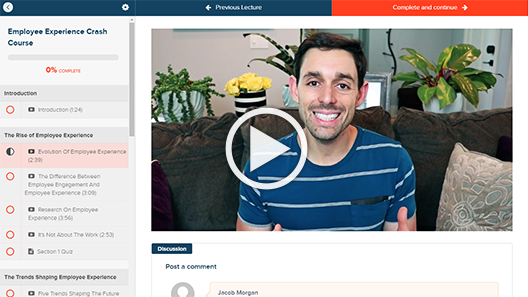 Get my free training series to create powerful Employee Experiences, or become a member of the new Facebook Community The Future If… and join the discussion﻿.